HITE SNIPE, Yelper, Lawyer, and Scooper are some of the popular names applied in various localities to this remarkably long-legged and long and slender-necked creature, which is to be found in temperate North America, and, in winter, as far south as Cuba and Jamaica. 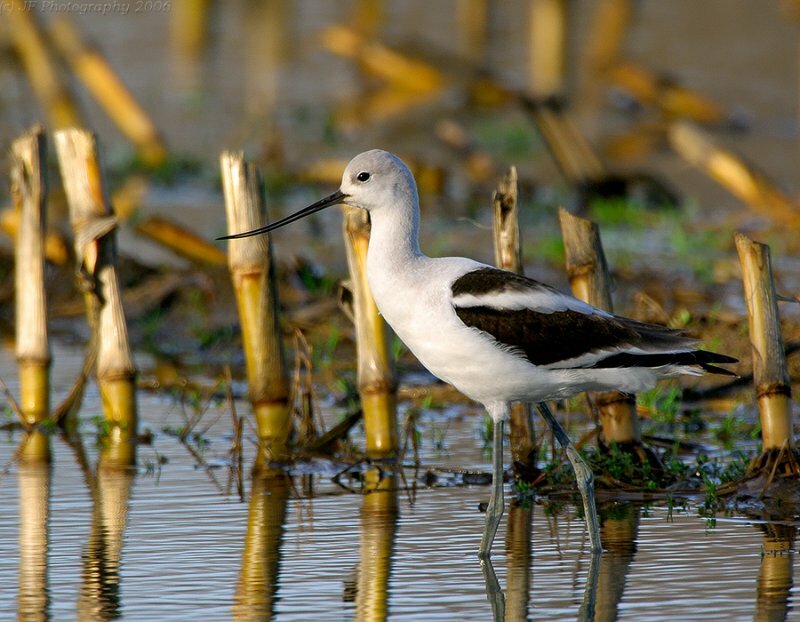 In north-eastern Illinois the Avocet generally occurs in small parties the last of April and the first of May, and during September and the early part of October, when it frequents the borders of marshy pools. The bird combines the characteristics of the Curlew and the Godwit, the bill being recurved. The cinnamon color on the head and neck of this bird varies with the individual; sometimes it is dusky gray around the eye, especially in the younger birds. The Avocet is interesting and attractive in appearance, without having any especially notable characteristics. He comes and goes and is rarely seen by others than sportsmen. american avocet. From col. F. M. Woodruff. Nest—A slight depression in the ground. Eggs—Three or four; pale olive or buffy clay color, spotted with chocolate. The American Avocet (Recurvirostra americana) is a large wader in the avocet and stilt family, Recurvirostridae. 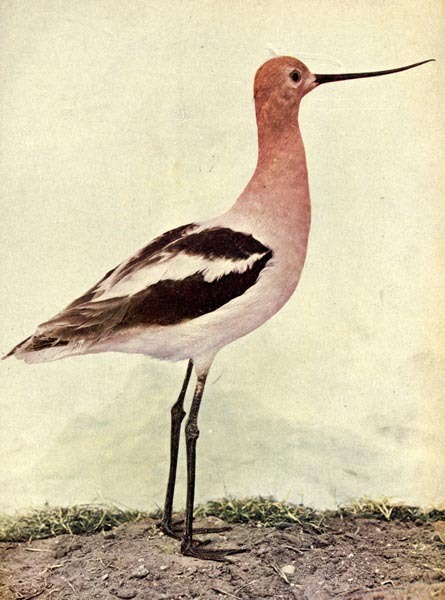 This avocet has long, thin, gray legs, giving it its colloquial name, “blue shanks”. The plumage is black and white on the back with white on the underbelly. The neck and head are cinnamon colored in the summer and gray in the winter. The long, thin bill is upturned at the end. The adult bird measures 16–20 in (40–51 cm) in length, 27–30 in (68–76 cm) and 9.7–15 oz (275–420 g) in weight. The breeding habitat is marshes, beaches, prairie ponds, and shallow lakes in the mid-west and on the Pacific coast of North America. American avocets form breeding colonies numbering dozens of pairs. When breeding is over the birds gather in large flocks, sometimes including hundreds of birds. Nesting occurs near water, usually on small islands or boggy shorelines where access by predators is difficult. The female lays four eggs in a saucer-shaped nest, and both sexes take turns incubating them. Upon hatching, the chicks feed themselves; they are never fed by their parents. They can walk, swim, and even dive within 24 hours of hatching. This entry was posted in Birds, Kid's Section and tagged Avocet, Birds Illustrated by Color Photography, Birdwatching, Christian, From The Past, Home School, Kids, Nature, Photography, Recurvirostridae, Vol 2 #1 July 1897, Youth. Bookmark the permalink.